Oh March you were good to us and I can’t believe you’re over already – this month flew by so quickly! We celebrated our 4 year wedding anniversary, I have officially lived away from Fresno for 4 years (time seriously flies), we got answers and are making a plan for something I hope to be able to share good news about someday soon, we had a really really fun spring break in Port Angeles and celebrated my 5 year work anniversary in Seattle with some of our favorite people (hoping to share more about that part of the trip soon too 🙂 ) . 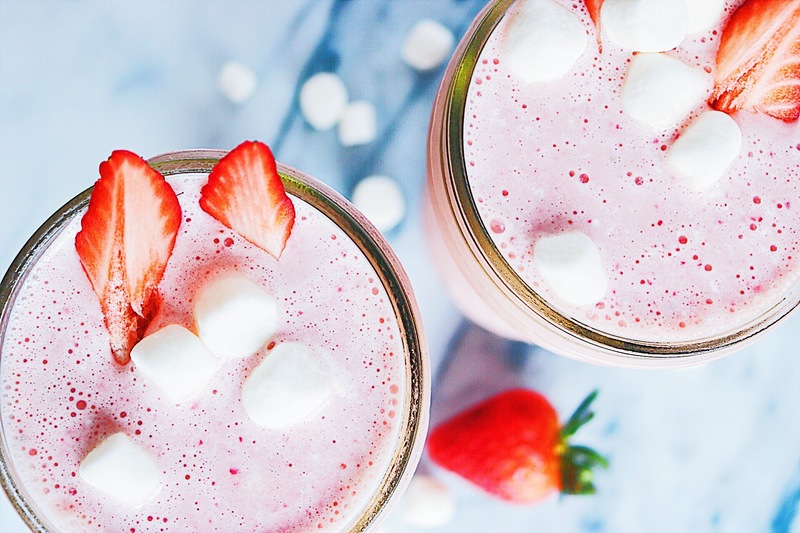 Another wonderful thing that happened this month was this Strawberry Marshmallow Milkshake that is dangerously delicious – seriously if I didn’t mind being 500 pounds I could drink one every day! I received a new BlendTec blender as a gift from the bowl game Eric’s team played in back in December and I’ve been using it seriously all the time – it is the best! I was probably the only person who picked the blender out of all the other cooler/high-tech/more-fashionable gifts, but I made the best choice for me and I love it! I’ve been playing around making different smoothie and milkshake combinations, cauliflower mash, soups and even salsa. 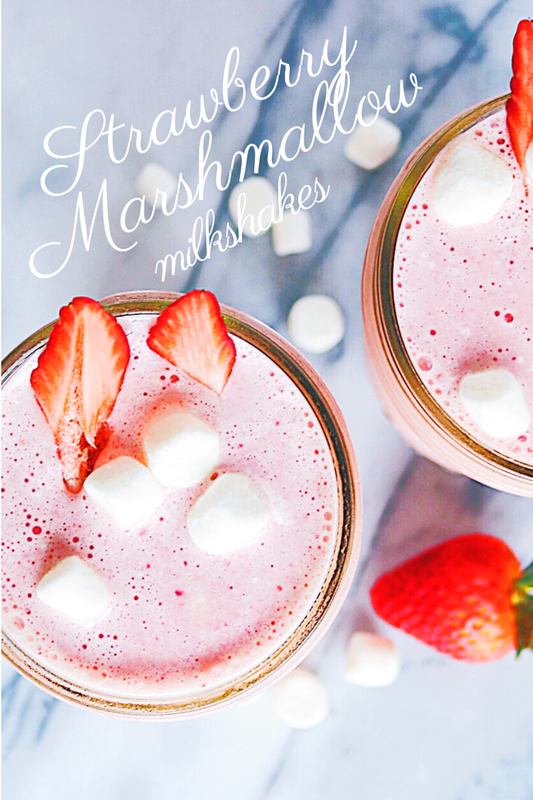 But my favorite of all the new recipes I’ve tried with my new blender is this milkshake that has loads of vanilla ice cream, fresh strawberries and a big gooey dollop of marshmallow cream. All blended together it tastes like strawberry marshmallow heaven! 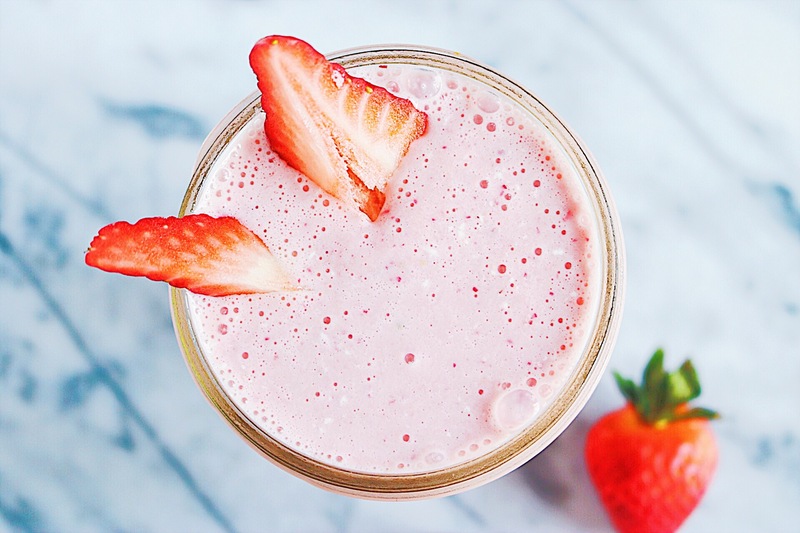 This milkshake couldn’t be more simple to make either! It’s a little bit of a stretch to call this a recipe since you basically just dump everything into your blender and whizz away. Scoop your ice cream, chop or don’t chop your fresh strawberries, top with a dollop of marshmallow cream, add a splash of milk and blend. 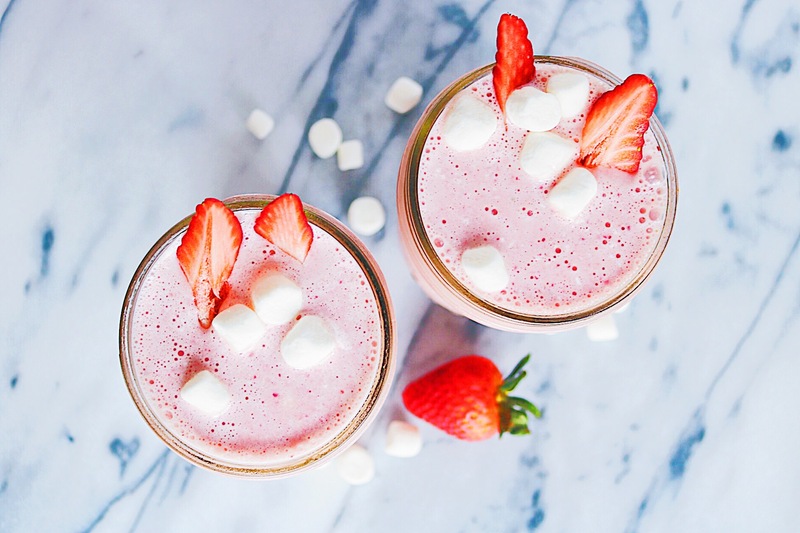 Pour into two glasses and garnish with some strawberry slices and mini marshmallows if you’ve got them laying around like I did and then try not to drink it in .2 seconds because you’ll probably want to make yourself another one right away. 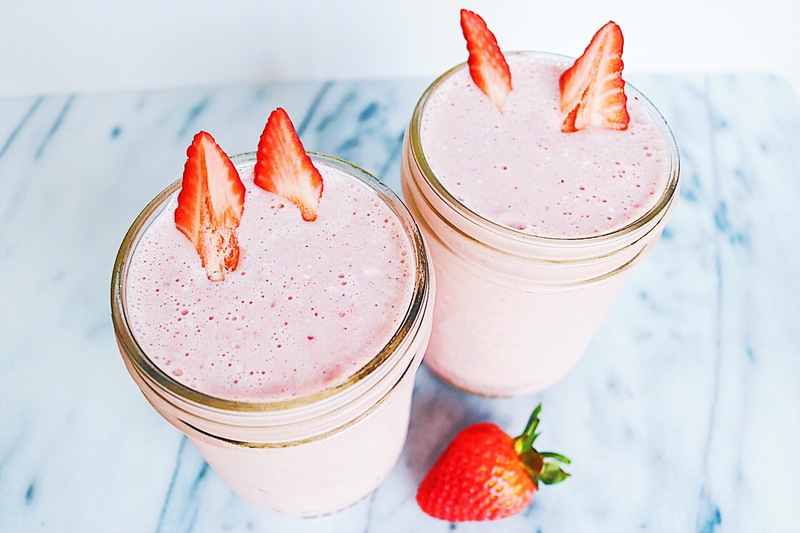 The strawberries remind me of cute little bunny ears! This would be a perfect Spring/Easter treat. Now go do yourself a favor and blend yourself one very large milkshake or split in two with one lucky person! Enjoy it with all your hearts delight and have a great day – because any day with this milkshake in it is a good day! 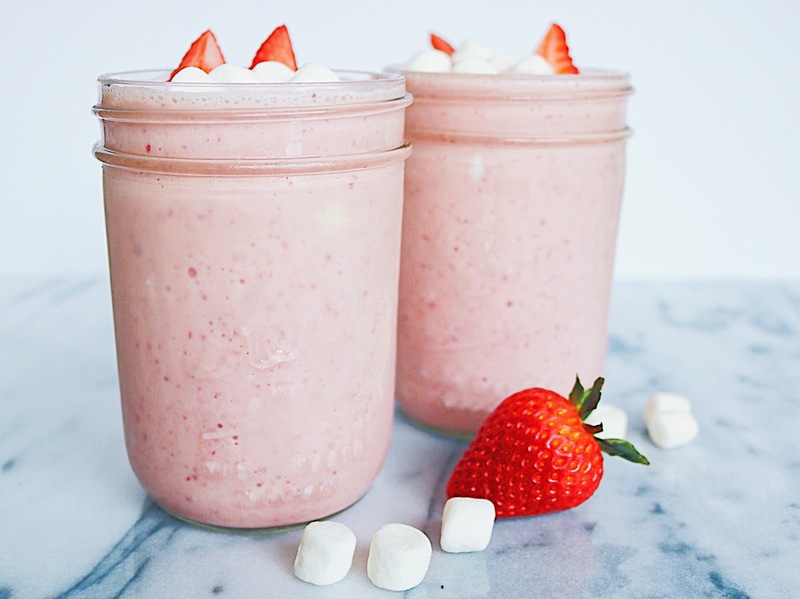 A dangerously delicious Strawberry Marshallow Milkshake recipe. Wash and dry the strawberries, remove the stems and cut them into halves. 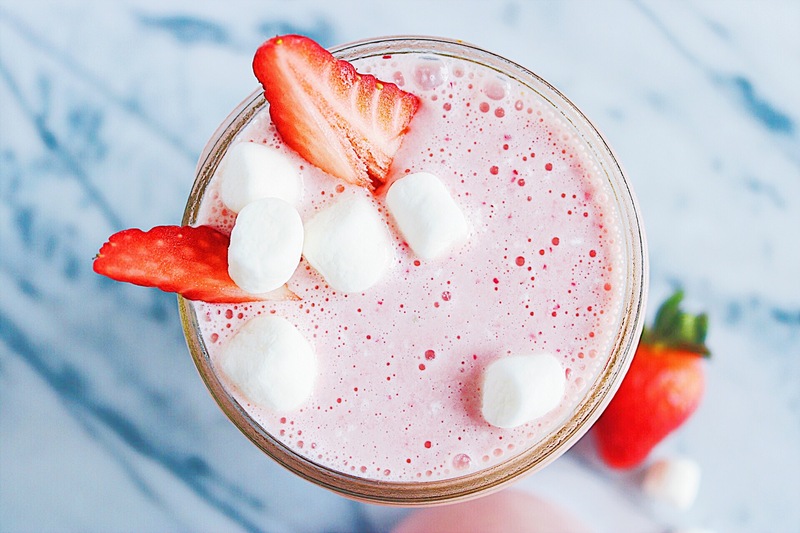 Place your ice cream, strawberries, marshmallow cream and milk into a blender. Blend until smooth and pour into glasses for some serious milkshake enjoyment! To easily measure out the marshmallow cream with a less sticky mess – spray your measuring cup and spoon with cooking spray beforehand. When you add the marshmallow cream to the blender try to dollop it right on top of the other ingredients without letting it touch the sides so it blends evenly and doesn’t get stuck to the blender. For easier sipping- drink your milkshake with a fun boba straw.